» Could Any Team Stop This Miami Play? For all the isolation sets the Heat ran for LeBron James and Dwyane Wade, they also ran some beautiful plays. Toward the end of the first quarter, they went to a staple of their offense (and a favorite of mine) from which they scored 10 points on just six possessions, including seven points on four first-quarter possessions. Those seven points constituted about 23 percent of Miami’s first-quarter offense, and they were all coming from different options of the same set. This set begins with a “horns” formation with a Heat player on each elbow (Chris Bosh and Shane Battier) and a player in each corner (Wade and James). We pick up this particular possession as Mario Chalmers inbounds the ball to Bosh. Then Chalmers goes to the opposite corner to be the first screener in a series of staggered screens. Battier trails him and sets the second screen. Next, James curls off both of these screens. By this point of the series, the Thunder know what’s coming. They are expecting James to come off the staggered screen, so they can protect against that option. But Oklahoma City overcommits so they aren’t in a position to help on defense elsewhere. 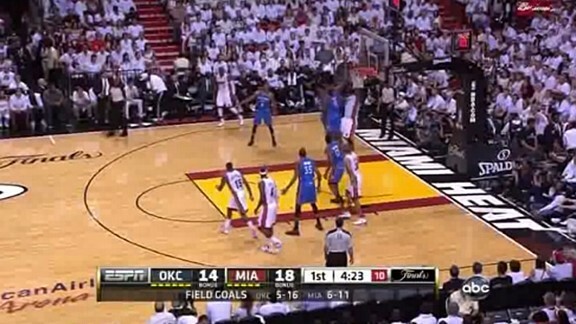 Bosh takes advantage: He attacks the rim and Kendrick Perkins can’t stop him. 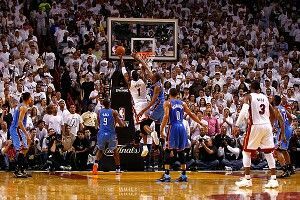 Serge Ibaka, preoccupied with James, gets there a split second late, allowing Bosh to finish at the rim. Here is the play in real time. How can you stop a play that has James in one corner curling off a screen, Wade in the opposite corner, and Bosh at the elbow? Here, the Heat try to run the staggered screen for Mike Miller, but it doesn’t appear too dangerous. Against most teams, Bosh would start bailing out his team, but here there is another option. They can swing James in the corner for a two-man game. Bosh follows his pass, sets a screen, and then pops out. He catches the ball on the outside and then attacks for the easy dunk. This play is so dangerous because this is not a set option. The Heat have the flexibility to exploit a favorable matchup or one their players’ specific skills. After setting up on the corner twice, James is now setting up on the elbow. Again, the Heat run staggered screens for Mike Miller. This time, though, with James holding the ball in this new position, the Thunder can’t focus too much on Miller. 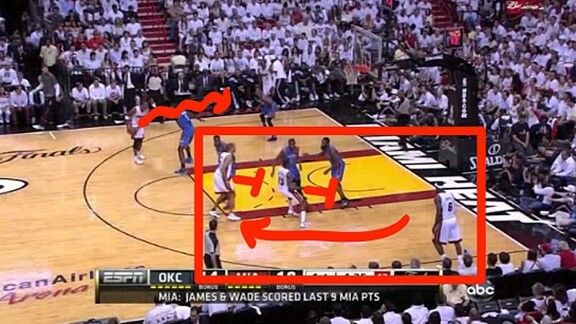 He is free to flare out as the Thunder rotate over to him, allowing LeBron the space to hit an open 3. 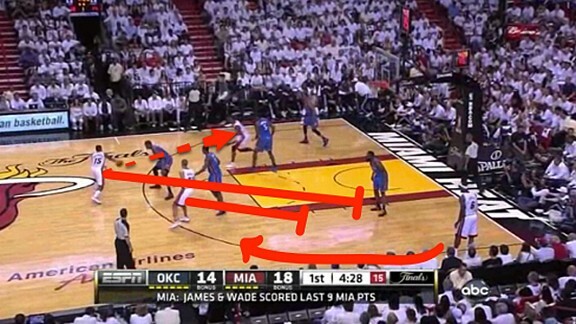 The Heat ran the same play three times, scoring off of three different options. That’s exactly what you want from a set run multiple times. Miami coach Erik Spoelstra has always designed plays to take advantage of all his stars’ skills, utilizing all three when they are on the court, and this is a perfect example.